GUNSHIP BATTLE: Helicopter 3D is a mobile action game that dips you into the world of the most powerful and dangerous combat helicopters you have ever seen and flied. This free application with exciting effects and 3D graphics is very popular all over the globe — there are 70 million players at this moment. The game takes you on a helicopter in a role of pilot who has to complete dangerous and breathtaking missions across our planet. A wide multiplicity of fixed-wing and rotary VTOL aircrafts will help you to success in this showdown. Controls are optimized for the best flight experience in 3D format. Wide range of equipment and deadly arsenal is available. Episode mode brings a lot of adrenalin due to be created on real-life conflicts base. Tabled game is compatible with both smartphones and tablets. Breathtaking military scenarios and flight control simulation makes GUNSHIP BATTLE: Helicopter 3D one of the best action military games on the market. Enjoy. 1) New custom missions have been added. 2) 2x Reward Stages on Custom Missions have been changed. 3) Black Market will reopen soon! Stay tuned. 4) Miscellaneous bug fixes and improvements have been made. 1) Aircraft customizing system has been added. 2) Episode 27 has been added. 3) 9T Blackmoth and 3T Whitemoth is here. 4) Black Market will reopen soon! Stay tuned. 5) 2x Reward Stages on Custom Missions have been changed. 6) Miscellaneous bug fixes and improvements have been made. 1) A new mode, Episode Attack Beta, has been added.2) Longinus and Behemoth are now available in lower tiers for purchase.3) 2x Reward Stages on Custom Mission have been changed.4) A new event : a chance to get the all-new Gunship Duck!5) Miscellaneous bug fixes and improvements have been made. New Gunship Behemoth has been added.3 new missions have been added to Episode 24.A new system has been added to Custom Missions that allows you to exchange Reward Tickets for rewards.A login event in celebration of 2018!Hidden Missions have been updated. 1) New episode 23 has been added.2) Stages for "Hidden Mission 2x Reward" have been changed.3) New Gold Packages have been added.Have any feedback?Leave a review or contact our customer support(gsbsupport@joycity.com) for any inquiries. 1. New Gunship Wildcat has been added.2. New episode 22 has been added.3. Two events in Custom Mission has been changed.- Mad Point- Destroy the Energy TowerHave any feedback?Leave a review or contact our customer support(gsbsupport@joycity.com) for any inquiries. 1. New Gunship SH-60 Seahawk has been added.2. New Episode 21 has been added.3. Some UI has been revamped.4. Hidden Market is now closed. (Remaining tickets will be automatically exchanged to Gold. 5 Gold per ticket.)5. Hidden Market Exclusive Gunship, Hell Tomcat has been added to the Shop.6. Package Shop has been deleted.Have any feedback?Leave a review or contact our customer support(gsbsupport@joycity.com) for any inquiries. 1. New Gunship "F-35 A Lightning II" has been added.2. New Episode 20 has been added.3. Ticket sale has ended.Have any feedback?Leave a review or contact our customer support(gsbsupport@joycity.com) for any inquiries. 1. New Plane "XF5U Flying Pancake" has been added.2. Custom Mission 2X Event has been changed.- Shark Hunting- Shadow Step3. New Episode 19 is now open.Have any feedback?Leave a review or contact our customer support(gsbsupport@joycity.com) for any inquiries. 1. A new plane "F-4 Phantom" has been added.2. New Episode 18 has been added.Have any feedback?Leave a review or contact our customer support(gsbsupport@joycity.com) for any inquiries. 1. A New Plane, "P-38 Lightning" has been added.2. 2X Custom Mission has been changed.- Crimson Tide- Deter Landing OperationHave any feedback?Leave a review or contact our customer support(gsbsupport@joycity.com) for any inquiries. 1. New Plane, "Eurofighter Typhoon" has been added.2. New Episode 17 has been added.3. 2X Custom Mission Event has been changed.- Destroy Giant-Copter- Lone WolfHave any feedback?Leave a review or contact our customer support(gsbsupport@joycity.com) for any inquiries. 1. New Plane "F-117 Nighthawk" has been added.2. 2X Custom Mission has been changed.- Tank Rush 2- Operation AtlantisHave any feedback?Leave a review or contact our customer support(gsbsupport@joycity.com) for any inquiries. 1. The new plane, "Cheyenne" has been added.2. Double Custom Mission has been changed.- Destroy Missile Turret- Trident Rush 2Have any feedback?Leave a review or contact our customer support(gsbsupport@joycity.com) for any inquiries. The world's most powerful gunships at your fingertips.1. New plane: "Pumpkin Raptor" has been added.Have any feedback?Leave a review or contact our customer support(gsbsupport@joycity.com) for any inquiries. The world's most powerful gunships at your fingertips.1. "Blackbird" has been added.2. Double Custom Mission has been changed- Missile Base Defense- Base Take Over OperationHave any feedback?Leave a review or contact our customer support(support@gsbattle.zendesk.com) for any inquiries. The world's most powerful gunships at your fingertips.1. A new plane, The Rafale, has been added.2. Double Speed Custom Mission has been changed.- Tank Rush 2- Warship RaidHave any feedbacks?Leave a review or contact our customer support(support@joycity.com) for any inquiries. The world's most powerful gunships at your fingertips.1. 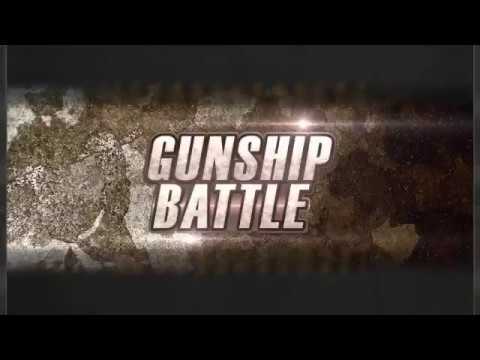 New Gunship "SuperHind" has been added.Have any feedbacks?Leave a review or contact our customer support(support@joycity.com) for any inquiries. The world's most powerful gunships at your fingertips.1. New gunship "Ghost Rider" has been added.2. 2x Rewards Custom Mission has been changed.- Tank Rush 2- Secure Air SuperiorityHave any feedbacks?Leave a review or contact our customer support(support@joycity.com) for any inquiries. The world's most powerful gunships at your fingertips.1. New Aircraft "Backfire(TU-22M)"2. x2 Custom Mission Change- Into the Bombardment- Conqueror of the SkyHave any feedbacks?Leave a review or contact our customer support(support@joycity.com) for any inquiries. The world's most powerful gunships at your fingertips.1. New Gunship "Hell Knight (AH-88)"2. New Effect-Screen turns red when HP falls below 30%.Have any feedbacks?Leave a review or contact our customer support(support@joycity.com) for any inquiries. The world's most powerful gunships at your fingertips. *Unprecedented Discount! (7/1~7/7)- T1~T3 (70% OFF)- T4~T6 (60% OFF)- T7 (50% OFF)- T8 (30% OFF)1. New Tier 8 Gunship"Berkut (SU-47)"2. New Episode 163. New x2 Custom Mission- Deter Landing Operation- Scorpion Hunt4. Gunship for In-App Purchase- F-22 RaptorHave any feedbacks?Leave a review or contact our customer support(support@joycity.com) for any inquiries.